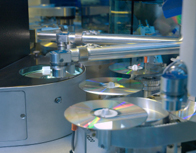 The most cost effective way of copying a lower number of discs is CD duplication. ‘Lower numbers´ usually means up to 500 discs. DUPLICATION STATION offer high quality, low cost and fast disc copying by utilizing our auto loading robotic machines. Our production line of optical disc duplicators make it possible for us to deliver our premium CD duplication services. One of the main reasons for choosing CD duplication for short runs of discs is speed. When time is short, and deadlines are closing in, to this day there is still no faster method than CD duplication. With our state of the art machines it´s actually possible for us to provide CD duplication runs substantially higher than our competitors. 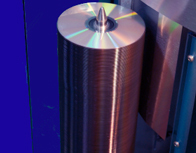 The industry standard within the CD duplication fraternity tends to be 500, but our unique machines allow for higher output speeds, yet lower costs. 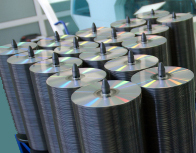 All CD duplication is carried out on A-grade media, so you don´t have to worry about quality issues. Despite this, our machines still have a very thorough system of quality control in place. The CD duplication process begins with a clone of your master disc being taken and then checked bit-for-bit to ensure 100% data integrity. This is then stored on a hard drive and CD duplications can be taken from that image. Then each disc is verified to make sure it plays properly. It´s quite a little journey those discs have to get through! A note about copying speeds: Through our many years of experience in CD duplication, we´ve noticed one particular type of client that is very keen to know the speed at which we carry out the whole process of CD duplication itself. Songwriters, musicians and bands are, naturally, very protective towards their creations, and who can blame them? Burn speeds are now up to 52x but there are debates within the music industry as to whether fast copy speeds can effect disc sound quality. CD duplication burn speed is clearly an important issue to some customers. For this reason, we have a special CD duplication service tailored to musicians with an ear for detail. We have a large collection of CD duplication equipment so we can dedicate separate machines to customers. But we can also dedicate numerous machines to carry out a single CD duplication job for a single customer, thereby lowering burn speeds. Please call for prices on this unique premium service.